National Express was accused by the union of "cutting costs at every corner"
Female staff on National Express trains between London and Edinburgh will not wear new uniforms because the blouses are too revealing, a union has said. The outfits were "simply too thin and too cheap", making them virtually "see-through", the Transport Salaried Staffs Association (TSSA) has claimed. The blouses, given to more than 500 women who work on the East Coast Main Line, have been sent back to the firm. National Express said it would change the fabric "if there is a problem". And it accused the union of "mischief-making" as the blouses followed "a standard shirt design from the manufacturers' catalogue". "Staff are not actually wearing the new uniforms yet, and they will not be asked to wear them until they are happy to do so," a spokesman for the rail company added. TSSA official Brian Brock said: "We don't see why our female members should wear see-through blouses. "All the female staff take a pride in their work and this is reflected in their existing uniforms which are smart and professional," added Mr Brock. The official accused National Express of "cutting costs at every corner". All staff wanted was for their new uniforms to be "smart and professional", he added. 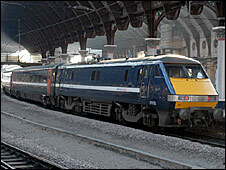 National Express took over the East Coast Main Line from GNER in December 2007. Staff have been wearing the old GNER uniforms until now, the union said. The rail company's spokesman said trials of the new uniform - which is due to be launched next month - had involved more than 150 employees. "We have had three different versions of the ladies' blouse, as staff thought previous versions were either too warm or too heavy," he added. "The latest proposed version of the blouse did not receive negative feedback during the wearer trials." And he rebutted Mr Brock's claim that too little money was being spent on the outfits. "This is not cost-cutting," he said. "The uniforms are of a high quality and we are investing in our staff."